One of our fantastic Facebook fans asked if we had any recipes for homemade dog treats. And we do indeed! Many of you probably do not know that I actually used to own a pet boutique. I did not sell puppies or any live animals for that matter, just high-quality products such as locally-made dog and cat toys, hand-knit dog sweaters, locally-made collars and leashes and the best quality treats and food. One of my best sellers was a dog treat made using this recipe. And best of all, it's wheat, corn and soy free! Many dogs are actually allergic to wheat, corn and soy. Some owners may not even realize it! These ingredients can give many dogs serious tummy troubles, so that's another reason why these homemade treats are sure to please. And if your dog is like the thousands out there that love peanut butter, even better. As always, please take your dog's specific health and diet into concern before trying this recipe. If your dog has a stomach that is sensitive to new things, it would be best to consult your veterinarian before adding anything new to their diet. Combine all of the ingredients into a food processor (you could use a hand mixer, but it would take much longer) and pulse for 30 seconds. Pulse one more time for another 30 seconds, if necessary, to ensure the ingredients are completely mixed. Just like making cookies, use a spoon to scoop the dough onto cookie sheets. You can make them as large or as small as you'd like, depending on the size of your dog. 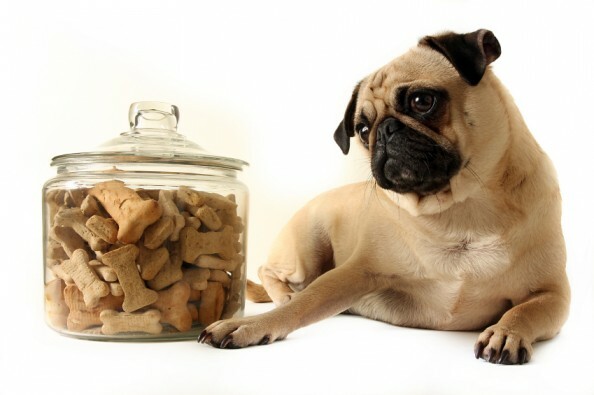 Owners of larger dogs may want to consider using two spoonfuls to make one cookie. Bake at 350 for 20-minutes or until the edges brown. Let cool and voila'! Healthy, yummy, homemade treats for your pooch. Storing these at room temperature for 2 weeks is perfectly appropriate, or you can store them for up to 6 weeks if kept refrigerated. Garbanzo & Fava Bean flour is simply an alternative to regular flour, and is comprised of ground beans. Dogs don't notice the difference, and you should be able to purchase it at any grocery store.